Need a personalized gift for that someone special? I just finished this little painting and listed it on eBay. 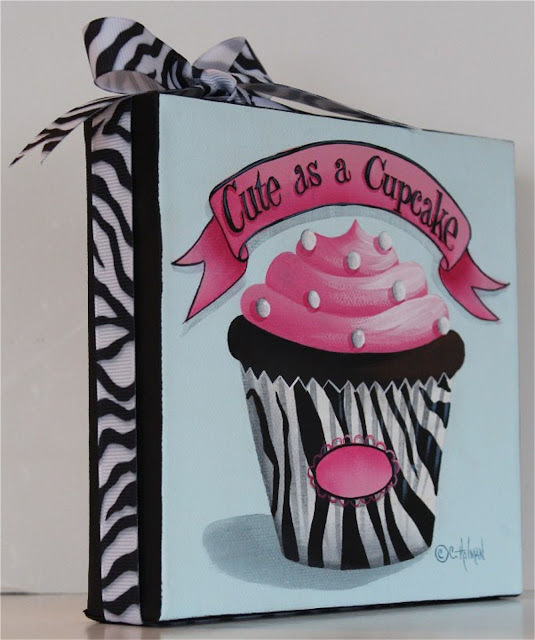 Hot pink frosting is piped high on top of a dark chocolate cupcake encased in a black and white zebra stripe liner. The painting on the left in the photo below, shows what the painting will look like personalized. The one on the left is going to a special little six year old. She's definitely "Cute as a Cupcake". 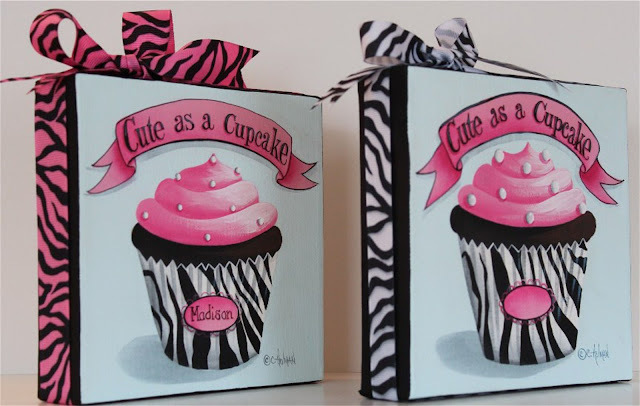 The buyer also has a choice between a hot pink and black zebra striped 7/8" ribbon or a black and white zebra striped 5/8" ribbon. The black and white is slightly more narrow than the pink and black ribbon. 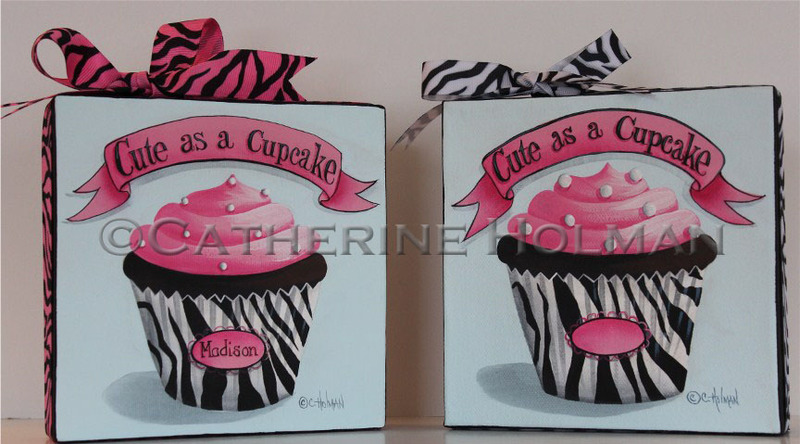 Hot Pink and Zebra print, what more could a girl ask for! Those are darling. What a good idea for a little girl's gift! That cupcake is so cute! What a great idea!! Thank you so much again!! I know she is going to absolutely love it when she gets it on her special day (as long as I can hold out until then lol lol) You did an amazing job, thank you again!! Great!!! I and my girls like it!!!!! Love your winter painting cottages. Interesting "step by step" I'm painting Sock Monkey Paintings right now. Haven't posted them yet. 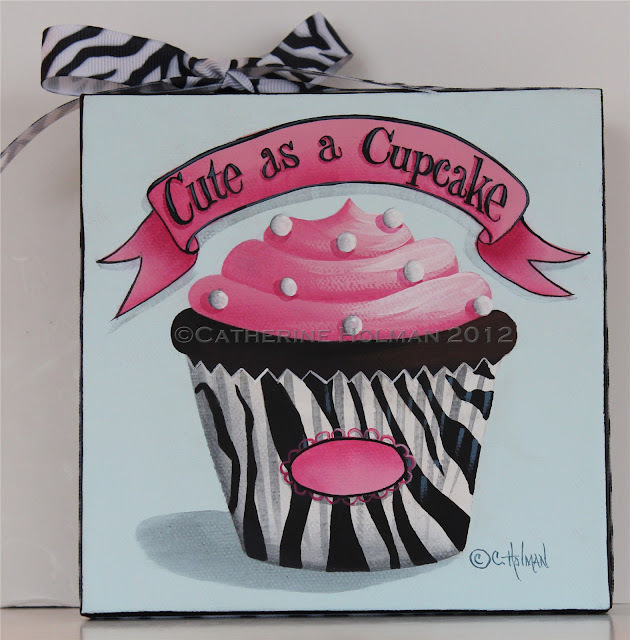 Your cupcakes are adorable Cathie! Thanks so much for thinking of us during J's health glitch. We both appreciate it so much! Catherine, your cupcakes are amazing, right down to the beautiful ribbon on the sides. Yum - yum. 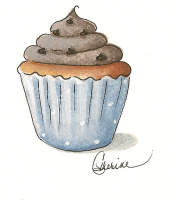 The Queen of cupcakes is back with a new delicious painting. It has been a long time since I visited you..your work is even cuter than before, if that's possible. I still have your pictures in my dining room.. So adorable for the little girly girl!!!! You are such an amazingly talented artist. I have a friend who is a baker and she loves pink. I will have to direct her to your site. She would be in heaven!! !